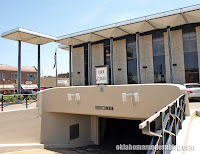 On a recent trip to Stillwater, Oklahoma we absorbed some of the Mid-Century karma that is sprinkled around the city. This is not an exhaustive list- just what we managed to visit in one day before we were exhausted. This beauty sits at the edge of the OSU campus on Duck just south of Hall of Fame. The unique steeple sports several bells and is flanked by the interesting roof. 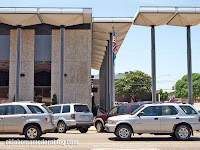 Downtown Stillwater is dominated by this 1967 bank building at 6th and Main. The bank features underground parking and unique "umbrellas" along the perimeter. 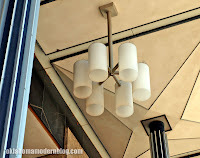 Above the entrance is this massive light fixture. This tidy box was dedicated in 1965 on Third Street, just around the corner from Hideaway Pizza. St. Andrews has some interesting stained glass windows. 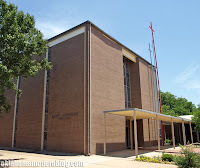 St. Andrews was designed by three church members, F. Cuthbert & Christine Salmon and Phil Wilber. I bet that awning was not their idea! Well, that's all for now. I'm sure we'll be back to Stillwater soon to search out more modern abodes and interesting structures.